Brazil's Workers' Party (PT) has formally registered jailed former President Luis Inácio Lula da Silva as its presidential candidate. Supporters chanted "Lula for President" and "Free Lula" as they followed PT members to the electoral court in Brasilia hours before the deadline. But the prosecutor general immediately filed to invalidate his candidacy, as his conviction was upheld in January. In Brazil, no one convicted of a crime upheld on appeal can run for office. Lula is currently serving a 12-year jail term for accepting a bribe. He was convicted of receiving a renovated beachfront apartment worth some 3.7m reais ($1.1m; £790,000) as a bribe by engineering firm OAS. Police say 10,000 people took part in the march to the Brasilia court house. 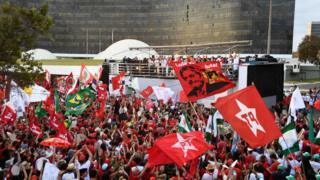 Despite his jail sentence, the PT voted to nominate Lula as its candidate earlier this month. Lula has reportedly chosen Fernando Haddad, former mayor of São Paulo, to run for the PT when he is likely prevented from doing so. While the ex-president is still waiting for a final court judgement on whether he can run, Brazil's prosecutor general filed to bar his candidacy due to the law prohibiting those who have lost appeals against their conviction from standing. 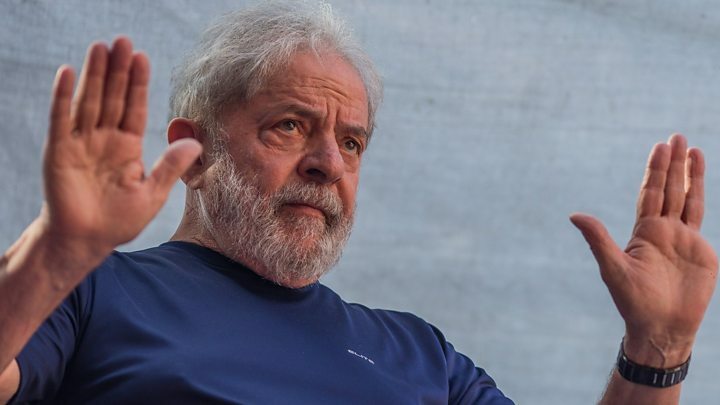 Despite this, polls reportedly show around one third of Brazilians would back Lula if he were allowed to run, which would make him the front-runner in October's vote.